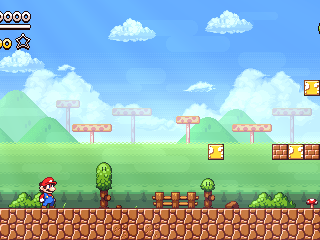 This is a game that combines the mechanics from 2D and 3D Mario titles and remixes several levels from the series. This demo only features 3 levels. I should note that the level design in this is still NOT final and will get major improvements later on. Nice work man, made me proud. I like the angled touch to Mario's face when he jumps. It'd be awesome if there was an option to play it in low resolution without the overlay effects. I personally think they're a bit too much. Could use some power-ups like some fireballs, but I'm sure that's all to come if they didn't after the first level. Also sweet remix if you made it. Howdy! Nice sage! Done into my and my grandma's birthday evening? SINCE is today my birthday :P EHEM the game? WHOA this looks like a BETA version of this game! Well i fell like Mario IS WAY TOO imortal! I wish you add LIFES so IT'S how Mario Games ARE done! Adventure,Rescuing,Power-ups,St omping,Mario itself,Game Over ETC. And the jumping animation REALLY reminds me of New Super Mario Bros! And also i saw a LIL' PROBLEM IN THE 2ND LEVEL. Like: When happens a thunder sound OOF the screen went BLACK! Fix DAT problem should ya'? Just one problem, when ever I got hurt when I was hold a shell and the shell was destroyed or thrown I went into a state where Mario was flashing forever and he couldn't move. I also got this glitch to happen constantly. I think the problem is when Mario is playing his hurt animation and it is canceled, he never regains control and the hurt affect doesn't stop. Other then that, I love this game and I can't wait for a full version. This is one of the BEST games ive ever played! Keep that good work up, Creators!